Another city, another sumptuous tennis club. Ho-hum. Any more of this and I’d be in danger of getting seriously spoiled. But after this tournament ends I will be heading home to New York City after seven months (broken up by a two month hiatus) on the road. 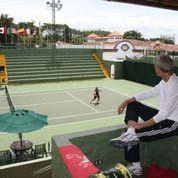 San Jose, the seedy capital of Costa Rica, will never be confused with Paris, but the Costa Rica Country Club, located a half-hour away in the upscale suburb of Escazu, can stand comparison with the best clubs anywhere. I flew in from Mexico City on Sunday, got settled in a cheap but airy downtown hotel and the next morning rode a bus to the club. Almost immediately I encountered my old friends from the Mexico City tournament, Stephen Taylor and his girlfriend Karin. I wasn’t surprised to see them; Karin Chykaliuk had mentioned to me that Stephen was entered in this event too. However, I was somewhat surprised to learn he had lost in the semis. Stephen is a rangy blonde Aussie who lives in Toronto and is ranked in the top one hundred in the world in the mens 60s. 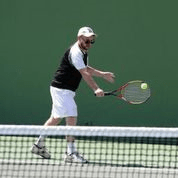 Like many of the competitors in these senior ITF tournaments, he’s a teaching pro, having worked at John Newcombe’s tennis camp in New Braunfels, Texas, among others. An even bigger surprise awaited me when I examined the draw sheet posted on the bulletin board outside the courts: yours truly was seeded number four. How can someone who hadn’t yet won a legitimate match be the fourth seed? No, it wasn’t because there were only four players. Perhaps they had me confused with another 60-year-old American named Richard Irving. Or they learned about my two impressive consolation match wins in Bolivia, one when my opponent retired with an injury and the other a walk-over. The first thing you see when you enter the venerable Costa Rica Country Club is its pretty nine-hole golf course. The rest of the club is equally impressive, with everything a weekend warrior could want except what I wanted most: clay tennis courts. These courts were hard, my least favorite surface by a factor too high to calculate. I’d known this beforehand, but San Jose was the only tournament listed for this week within a radius of five hundred miles, so I decided to go for it. When I examined the draw sheet more closely, I noticed a curiosity; except for me, Stephen and another Canadian, seemingly all of the male entrants were named Carlos. I found a Carlos to hit with; he was a friendly Nicaraguan who had arrived here after an all-day bus ride from Managua. As we began hitting, I was encouraged to note that he was around my own level. The tournament was designated grade 4, the second lowest level, meaning that many of the top local players wouldn’t be entered. Despite the surface, I thought that maybe I could win a match or two. Afterwards a bunch of us, Carloses and non-Carloses alike, were sitting around kibitzing in the spacious corridor outside the courts. Carlos the Nicaraguan, who had played this event before, mentioned that he didn’t like the way it was run. ” Yes,” grumbled another Carlos, ” the welcoming party is on the last day instead of at the beginning.” “Suppose we lose in the first round–why should we have to hang around until Sunday?” chimed a third Carlos. I couldn’t fault the Carloses’ reasoning. Furthermore, the men’s singles finals was scheduled for Sunday, meaning that if by some miracle I made it that far I would have no choice but to forfeit; my flight back to New York was scheduled for late Saturday night. I had arranged it like that deliberately because I was homesick; besides, on the last day of most tournaments not much happens. But here they did things differently. My opening round match (it was the second round because as a seed I drew a bye in the first round) was played under a broiling mid-afternoon sun and with a sirocco-like wind. It was a hard-fought contest, with the outcome in doubt until the end. But I eked out a win in straight sets over yet another–you guessed it–Carlos. I was elated. Playing in my last international tournament and under very difficult conditions, I had finally broken through. But no sooner had I collapsed into my chair to savor my victory than the lanky teenage ballboy came over and demanded five dollars from each of us. We paid him but we both felt that, under the circumstances, they should have asked us beforehand if we wanted the services of a ballboy. Still I was in too good a mood to let it spoil my win. “Good job, Carlos!” I called after him. Now I was in the semis. Wanting to ride a hot hand, I hoped the match would be played the next day or, at the latest, the following day. 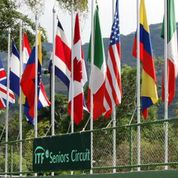 But the tournament director informed me that both men’s semis were scheduled for Saturday afternoon, and I couldn’t persuade him to change the date. And if I won …well, instead of playing in the final, I would be cruising at 30,000 feet above the courts. Over the next few days I was able to get in several hitting sessions with Stephen and another Carlos or two. I felt that I was hitting the ball well and looked forward to the match. But Friday evening I realized to my shock and horror that I was coming down with a virus. I felt weak and feverish and had no desire to get out of bed. I was beside myself with frustration. If my condition didn’t improve, and fast, there was no way I could play the match. I drank water and orange juice; I chewed advils; I forced myself to go outside and stood in front of the hotel gulping fresh air till I was exhausted. Nothing helped. When I awoke on Saturday morning I felt no better. I waited until the last possible minute before phoning the tournament director and explaining to him that I must forfeit. Of course that night I began to feel better. As I had suspected, the virus was one of those 24-hour deals. I could only shake my head over the illness’ bizarre timing; it was as if the gods had conspired against me. I almost wished that it had lasted several more days; I would’ve felt less frustrated. Oh well, I hadn’t expected to win my first match, so in a sense this was a kind of cosmic justice. Still the more I thought about it the more certain I was that I would’ve won my semifinal match. And then if I had gotten a few breaks in the final…well, who knows?